Anna Barbara Webber (1884-1922) was born in Dartmouth, Halifax County, Nova Scotia. She was a descendant of George Webber (1739?-181-?) who immigrated to South Carolina from Germany and later came to Nova Scotia with other Loyalist settlers in 1782. Anna Barbara’s family lived in Dartmouth from 1891 to 1901, and from 1905 or earlier, she lived in Dartmouth and worked as a domestic servant for the family of Richard Romans. On September 16, 1914 Anna Barbara married William Wilson Webber (1882-1968) and around this time moved to Upper Lakeville where William was employed as a lumberman. Anna Barbara and William had three children: Allen Otto (1915), Frances Rita Eliza (1916), and Blois Milton (1919). Allen Webber served in the Second World War, was a steamfitter, and lived in Dartmouth and other locations before retiring to Upper Lakeville. Blois Webber lived in Meaghers Grant, and also served in the Second World War from 1943 to 1945 before being wounded in Belgium and sent home in May of 1945. He was a woodsman and hunter and worked at Fairey Aviation and IMP. 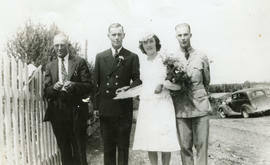 Frances Webber married Douglas Onslow Robson in July of 1943 in Lake Charlotte and they lived in Woodside, Dartmouth. Records were in the possession of Anna Barbara Webber and later her daughter Frances Robson. After Frances Robson’s death in 2004, her niece Lois Miller inherited the records. Lois Miller donated some photographs and correspondence to Nova Scotia Archives and Records Management (NSARM) in 2006 and they were subsequently processed and arranged. In 2008 Lois Miller donated the remainder of the records to the Eastern Shore Archives. In 2010 the records at NSARM were transferred to the Eastern Shore Archives and were rearranged and integrated into the fonds as a separate accession. Fonds consists of records of the family of Anna Barbara Webber, created and/or accumulated by Anna Barbara Webber and later her daughter Frances Robson. Records include photographs, family land records and research, certificates, announcements, and wartime records. Donated by Frances Robson’s niece Lois Miller in 2008. Some photographs and correspondence were transferred from Nova Scotia Archives and Records Management in 2010. Different accessions are arranged separately. Many of the photographs have been scanned into the Eastern Shore Archives photo database. Researchers are asked to view scanned copies of photographs as opposed to originals when possible. Accession number 2010.009 was originally accessioned with the number 2008.013, but was re-accessioned with the number 2010.009 at the time of cataloguing. Accession number 2010.010 was originally accessioned with the number 2006-036/001 while at Nova Scotia Archives and Records Management, but was re-accessioned with the number 2010.010 after being transferred to the Eastern Shore Archives. Other records related to Anna Barbara Webber can be found in the Anna Barbara Webber postcard collection, accession number 2008.013. Eastern Shore families: Clam Harbour / Robert Kim Stevens. – Lake Charlotte: Maritime Imprints, 2000. 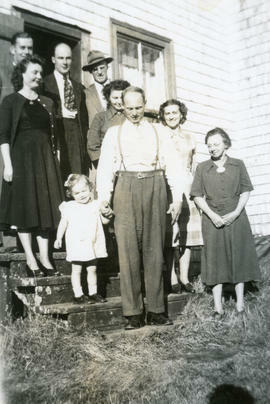 Webber family of Nova Scotia / Carl Webber. – Halifax: Carl Webber, 2002.